Just what is happening with the weather right now? Even as this article is being written, on a summer evening in August, the wind is battering at the window and it is pouring with rain. While this goes on, people in other parts of the country are sweltering in a heatwave - lucky them! If you are in one of the areas affected by the high winds and driving rain, then you could be at risk of water leakage from damaged roofs - protect it and fix it with Twistfix. To solve this damaging problem, Twistfix offer our innovative and highly effective Roof Sealing Paint. The sealant is quickly and simply applied. producing a coating that, strong and durable, exhibits an outstanding water-resistant property. This property becomes apparent instantly upon application, creating an effective waterproof seal on most roofing materials; this instant barrier means that the product can be used even while it is raining as it will not be washed away throughout the process of curing. This product is designed to be easy to use: applicable with brush or spatula, the solar-reflective paint usually requires just a single coat and does not require the use of a primer, making the paint a highly cost-effective option. Twistfix Roof Sealing Paint has an elastomeric formula that makes it versatile enough to be used on roofs created from or covered with most materials, including metal, asphalt, slate, concrete and felt. Offering unmatched protection from all of the elements and suited for use on flat roofs, valleys, lead bays, gutters and roof lights, the formula includes fibres engineered to enhance flexural strength, bending with natural thermal roof movement, this really is a miracle product. 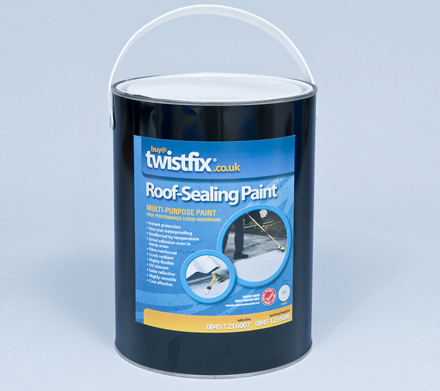 As one of the most effective acrylic roof sealants available on today's market, Twistfix Roof Sealing Paint is supplied in 5kg tins. Each tin is sufficient to cover around 4M² of roof surface so they are amazing value for money. This product is just one of the comprehensive range of damp proofing systems provided by Twistfix. For further information, please contact our highly-experienced team on 0845 123 6006 or by email at sales@twistfix.co.uk. You can also chat live with us online during office hours.